Your animal companion doesn’t need to be present during your consultation. When you book a consultation I ask that you have your questions and/or concerns ready about your animal companion or the animal you are concerned about, then I can “give your pet a voice” so you can understand what your pet is trying to tell you and you can communicate with each other; either by email, telephone or postal; which ever is easiest and more convenient for you. During your consultation it’s all right if you aren’t with your animal companion. If you have a recent picture of your pet, that’s great but if not thats fine also. I’ll ask you questions such as; what is the animals name, age, gender, and species, how long you have had or known about the animal. Don’t worry if you don’t know that’s fine also! You can send me a picture if you like but it’s not necessary for me to get your answers you need. I also do healings on animals if needed during your consultation, no extra charge. Feel free to ask me anything that is concerning you. I do not judge anyone and my heart is always open to you. I’ve worked with thousands of species worldwide such as; cats, dogs, horses,whales, tigers, elephants, alpacas, farm animals, zoo animals, wild/domestic cross breeds, horses, reptiles, rabbits, hamsters , etc. I help ALL animals/mammals/species with Physical, Emotional and Behaviour issues such as aggression, fear, allergies, phobias, to name a few. I also work with animals that have passed over. I am an animal communicator, animal whisperer, animal behaviourist, pet psychologist, to name a few. During your consultation I can make suggestions for you about Homeopathic remedies, herbal tinctures, flower essences and nutritional supplements that may better help the animal in question. Remember they are only suggestions and they do not substitute for veterinarian care. *Disclaimer: I do not diagnose nor treat, as I am not a veterinarian. How is my pet feeling, are they in pain anywhere? Would my pet like to have a companion, are they lonely? How can I make my pet’s life more comfortable? My pet has been sick for a long time and is very old: is he/she ready to pass over? Why is my cat going outside his litter box? Is my pet happy with his food, does he/she have any allergies I should be aware of? My pet does not like to travel is there something I can do to make travelling easier for him/her? 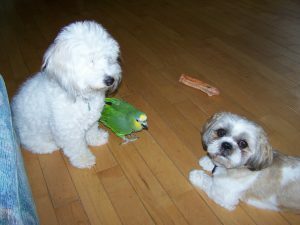 Does my pet feel at ease with their: pet sitter, kennel, trainer, stable mates, paddock, barn? Why is my dog or cat urinating and defecating in our house? Note: Having an open mind during the consultation will allow the animal to communicate easier and let the consultation flow better. If you are located in the U.S or Canada I can phone you once we set up a date and time for your consultation, otherwise we can communicate through email or postal. 1-3 animals, complete consultation. For additional animals, inquire. Payment is due prior to your consultation appointment, I accept E-Transfer, Visa, Master Card and Pay Pal. If you send a certified Money Order (cashable in Canada) it must be received and cleared before I will book your appointment. Personal Checks must be recieved and cleared before your appointment can be booked (it usually takes 6 business days for the bank to clear). Then I would contact you to set up a date and time. 24 hours is greatly appreciated so I can schedule another animal who needs to be heard. Feel free to contact me at kmalonie@eagle.ca or 905-342-5312 to leave a message. The Animal Whisperer 2019 | All Rights Reserved. Animals theme by Flythemes.